Beautiful! It’s awesome to see a video game character as iconic as Mario take a break from announcing his own presence to instead announce the presence of a pivotal suffragette. Even though Susan B. Anthony is not actually arriving and is nowhere to be found in the Mushroom Kingdom, it’s still completely inspiring to imagine Mario shouting “It’s-a she, Susan B. Anthony!” as he jumps over pipes and squashes goombas. Thanks to this drawing, the gaming industry—and the entire world—just became a better, and more feminist place. 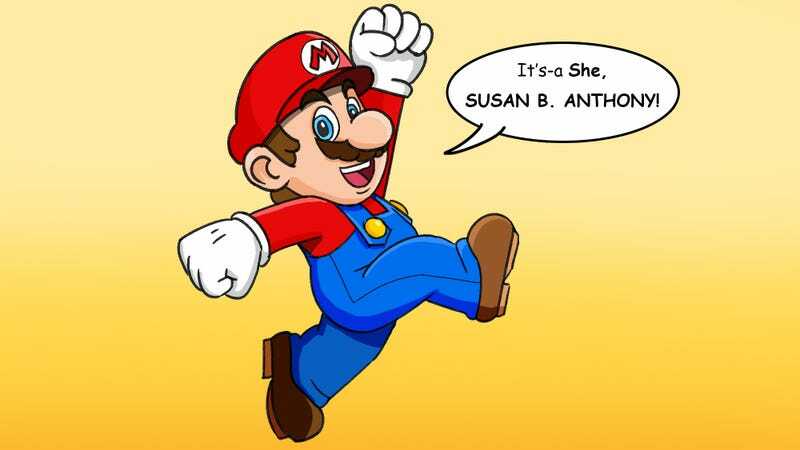 Some upset fan boys might think Mario should only say “Mario” after he says “It’s-a, me,” but Susan B. Anthony is just as deserving as Mario to have her name shouted by Mario. Susan B. Anthony campaigned for women’s voting rights, and she did it without any help from growth-inducing mushrooms or invincibility stars, so if anything, she’s even more of a hero than Mario is. Nintendo could take a page from the wonderful example set by this drawing. Let’s hope the company does the right thing and makes Mario shout “It’s-a she, Susan B. Anthony!” in all future games!